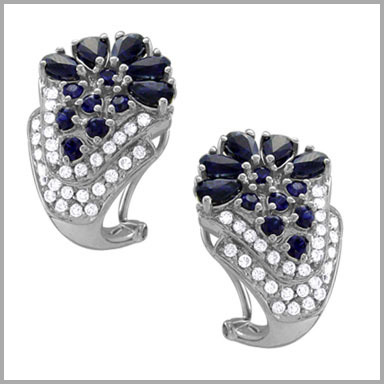 These amazing earrings are crafted in polished 14K white gold. Each features five pear cut 5 x 3.5mm sapphires in prong settings at the top. 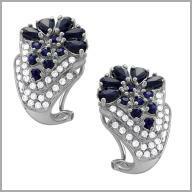 They are followed by a cascade of seven round cut 2.1-2.5mm sapphires in prong settings. Each design is finished at the bottom with the 28 full round cut diamonds in prong settings. The total sapphire weight is 3.98ct and the total diamond weight is 0.67ct (both approximate). The diamond color is G-H with a clarity of SI. They measure 7/8" x 1/2" and have posts with omega backs.